“So, for example in a so called strategic alliance contracts with the NDPC, the promoters of the companies made away with over 3 billion US dollars, almost a tenth of our reserves at a point! 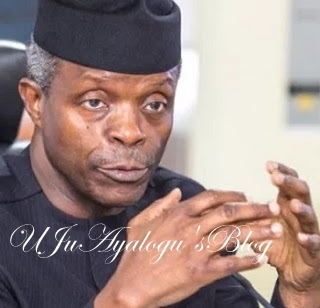 But Osinbajo fired on, saying: “In one single transaction, the sum of N100 billion and 289 million dollars in cash were released a few weeks to the 2015 elections, it was not released as such, it was the money embezzled. “So, the total spends on capital in these critical areas I have mentioned was only N153 billion, and over N150 billion was released and shared within three days. This is enormity of what we are talking about; there is no country in the world that can survive on grand corruption on the scale that we are talking about. And that is why it is important for the federal government of Nigeria under President Muhammadu Buhari to reverse that grand corruption.